Top off a bathroom sink or vanity with the reflective glamour of this chic, round wall mirror. 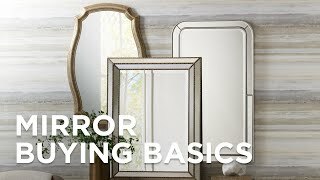 Perfect above a vanity, this Molten round frameless mirror can be installed horizontally or vertically to upgrade any space. Constructed of two layers of strong beveled glass and metal, this beautiful modern mirror is full of elegant features. Complete with double coated silver backing and seamed edges, this reflective decoration adds depth to any bedroom or living room. 27 1/2" wide x 27 1/2" high x 1/2" deep. Hang weight is 23 lbs. Glass only section is 22 3/4" wide x 22 3/4" high. Beveled edge is 1/4" wide. 4-5mm thick mirror glass. Molten round frameless bathroom wall mirror. Crafted from two layers of thick, strong 3/16 glass and metal. Double coated silver backing with seamed edges. Beveled glass. Ringed in looping swirlsthis oversized sunburst wall mirror shows off an inviting gold leaf finish.